The success of a homegrown Welsh project that has become a blue print for agricultural business support across Europe is highlighted in an independent report published today (October 22nd). Cywain Agriculture, was set up by Menter a Busnes in 2008 to offer Wales-wide business support for primary producers, and has succeeded in creating jobs and bringing new products into the marketplace. An independent evaluation has now been carried it into Phase 2 of the project (2013-15) by the experienced evaluators the Rural Development Company Ltd. It identifies several key factors in Cywain Agriculture’s success, and offers recommendations as to how a success for Cywain Agriculture might be shaped to meet the priorities identified in the 2014-2020 RDP for Wales. Cywain Agriculture’s collaborative approach is highlighted as a key element, along with its emphasis on understanding the entire supply chain, in developing products in line with market trends and demand. While it’s ‘bottom-up’ style gives the primary producer – or group – ownership of the venture. This the report says has been shown to enhance the success and survival rate of supported initiatives, with Cywain Agriculture exceeding its employment targets between 2013-15, creating a total of 98 jobs (full and part-time) and safeguarding a further 180 positions. Cywain Agriculture delivers its support as a bespoke package, giving clients one-to-one assistance pertinent to their particular needs. Projects have included assistance with market research and establishing a brand, packaging and retail labelling and test trading. Appropriate mentors and consultants are brought on board to provide specialist support in specific areas such as packaging design, manufacturing systems and finance. Workshops are also an integral part of the process. Its ‘central approach’ is to strengthen the capabilities and confidence of the participating businesses by encouraging them to identify new markets and add value to their products. Cywain Agriculture is see to have a “relaxed and trusting atmosphere” and a “very supportive environment”, while a survey of clients also found the interpersonal skills of the Development Managers played an important part too as many come from farming backgrounds and so understand the issues facing agricultural enterprises. Cywain Agriculture’s adaptable, flexible nature and relatively informal approach is seen to enhance its accessibility. Five new work streams were included during Phase 2: Test Trading, Labelling, Bees and feasibility studies on Hops and Public Procurement. A final feasibility study into an environment work stream is to follow. Cywain Bee, for example, was introduced to boost the Welsh honey industry by mentoring honey producers and encouraging farmers to place beehives on their land. While the Test Trading work stream has resulted in 68 businesses testing 147 new products across some 20 events. The project, which is supported under the Rural Development Plan (RDP) for Wales 2007-2013 Supply Chain Efficiencies Scheme, has now reached the end of its latest stage. Menter a Busnes, chief executive Alun Jones said, “We are delighted that the evaluation report endorses the fact that Menter a Busnes are delivering innovative support to industry which has real results”. ‘Cywain Agriculture – Sharing Success’ will be held today (October 22nd) at The Town Hall in Talgarth, which is adjacent to Felin Talgarth Mill, itself a recipient of support from Cywain Agriculture. The event will feature case studies of companies who have received help from Cywain Agriculture, among them Cwm Farm Charcuterie, Beri Da and Felin Talgarth Mill. Cwm Farm Charcuterie Products began five years ago when carpenter Andrew Davies and his school administrator wife Ruth began rearing pigs and selling their own pork and sausages. Today, with help from Cywain, the venture has grown into a thriving enterprise producing an innovative and award-winning range of salamis and cured meats. Their fresh Laverbread sausage received a gold star at the 2015 Great Taste Awards and while their Laverbread salami was awarded first place by Rosemary Shrager at the recent Great British Farm Produce Awards. In March this year Cwm Farm opened its own specially designed processing unit in Pontardawe – named Salami HQ. The new unit, which includes a special drying chamber imported from Italy, will enable Cwm Farm to not just add value to their own pig meat but to meat produced by other smallholders. Cwm Farm’s products are sold to numerous delis and used by top restaurants across the UK – some of whom work with Ruth and Andrew to create bespoke salamis. They also sell their range at farmers’ markets, food festivals and at Scarlets rugby home games. Through Cywain, the company has also established an award-winning link with Margam Park near Port Talbot. The combination of Cwm Farm’s meat processing flair and skill and Margam Country Park’s 400 strong herd of deer has led to an exciting new project creating a range of venison cuts and cured meats and so opened up new marketing opportunities. Says Ruth, “Cywain have been with us every step of the way. They have been an absolute rock and the support and help we have had has been tremendous. Through Cywain we have been able to forge new opportunities and take part in events including the Royal Welsh Show and the Farm Shop & Deli Show Birmingham. 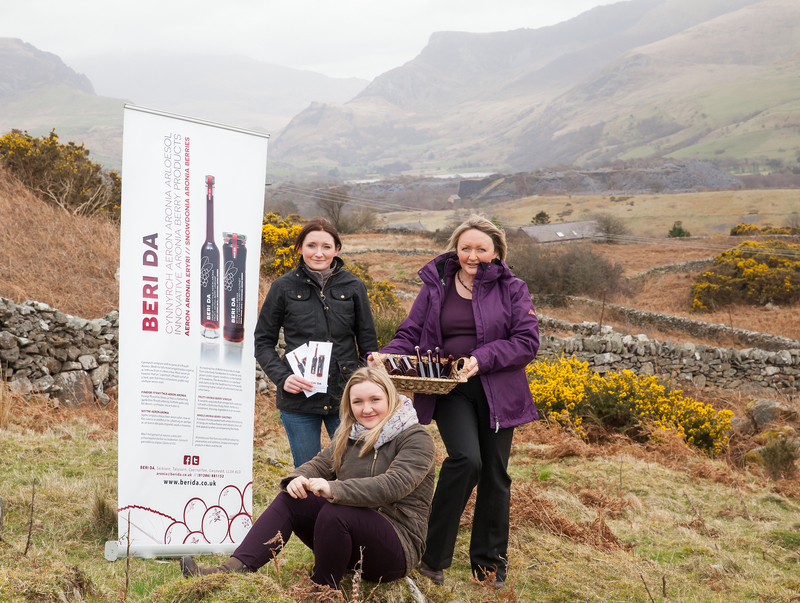 It has been a world-wind year for Snowdonia producer Beri Da, which with Cywain’s help has been catapulted onto to the shelves and into the kitchens of some of the most prestigious restaurants and stores in the world. Founded by Vicky Williams-Griffith and her mother Angela Williams, Beri Da produces chutneys and fruity vinegar from Aronia berries – the first of their kind in the UK. Grown at the foot of Snowdon on the family’s farm at Llandwrog near Caernarfon the berries are then hand-made by Angela, Vicky and her sister Anna Livingston into award-winning preserves. Cywain assisted the family with product development and brand creation, including test-trading opportunities at events such as the Royal Welsh Winter Fair. Within weeks of its launch in Easter 2015, Beri Da’s products were snapped up by London’s Savoy Hotel and iconic store Selfridges – the latter featuring the company as a ‘Hero Brand’ in its ‘Meet the Maker’ campaign. In recent weeks accolades have started to flow in too with their Fruity Aronia Berry Vinegar scooping a gold star at the 2015 Great Taste Awards and was highly commended by the judges at the British Farm Produce Awards. Said Angela, “We started growing Aronia berries 11 years ago as part of a diversification project. They are amazingly versatile and we experimented with a number of ideas. When Felin Talgarth Mill was thinking of a strap line for its Welsh flour, Cywain suggested ‘Blawd o safon, o rym yr afon’ – ‘Quality flour from the power of the river’. With Cywain’s help the ancient Mill has established a strong and award-winning brand, which has caught the eye of retailers and consumers alike. Now a thriving community enterprise run by a group of dedicated and passionate volunteers, the once derelict Mill’s restoration story began in 2011 as part of the BBC’s Village SOS TV programme. Four years on, and with assistance from Cywain, business is booming. Expectations and targets have been exceeded, and by the end of last month (September) the Mill had produced and sold more flour than in the whole of 2014. The quality of the flour – and the baked goods made in the Mill’s café – has resulted in a number of awards for the enterprise. Following the success of Talgarth Mill’s strong bread flour in the 2013 and 2014 Great Taste Awards, three more flours were awarded stars in the 2015 competition – Seven Seeds Strong Flour, Plain Flour and Blawd Cymreig, which is milled from Welsh organic wheat grown locally in Bwlch. The Bakers’ Table (The Mill’s café) has also tasted success winning their first Great Taste Award star for their Bara Felinwr – which is made with 100% Talgarth Mill wholemeal flour – and accolades at the World Bread Awards 2014. The enterprise’s flour and bread kits are sold by a number of independent retailers, and distributed by Castell Howell and Blas ar Fwyd. They are also sold at Talgarth Mill Craft Shop – which features products from local craftspeople and producers. Liz Rose, Manager of The Mill said, “Since Cywain helped us with the rebranding of our flour and bread kits in 2014, we’ve seen a dramatic increase in sales, both retail and wholesale. “Now, in the run up to Christmas our sales of bread kits will increase further and our more recent support from Cywain to develop the instruction format inside the bread kits, will ensure that these will be of the same professional standard as the labels on the outside.